Lot Detail - Montefiore's 100th birthday was celebrated as a national event in his native Britain and by the Jewish community world-wide. Montefiore's 100th birthday was celebrated as a national event in his native Britain and by the Jewish community world-wide. A WISP OF MYRRH IN A BED OF SPICES. 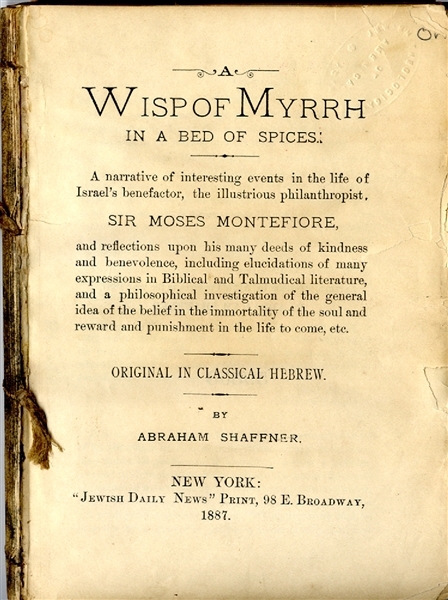 A NARRATIVE OF INTERESTING EVENTS IN THE LIFE OF ISRAEL'S BENEFACTOR, THE ILLUSTRIOUS PHILANTHROPIST, SIR MOSES MONTEFIORE. Montifiore, Moses, Sir) Shaffner, Abraham. : New York: "Jewish Daily News" Print, 1887. 12mo. 105, 96, 128 pages. In English, German, and Hebrew; each with own title page. Errata to the English section, slip inserted. German title page: Zeror ha-Mor ba-Arugath ba-Bosem = Myrthenstrauss und Gewürzbeet. Hebrew title page: Tseror ha-mor ba-`arugat ha-bosem. Sir Moses Montefiore was a 19th-century English philanthropist. Singerman 3593. Lacks boards still VG. Last one we sold was 2006 for $275.